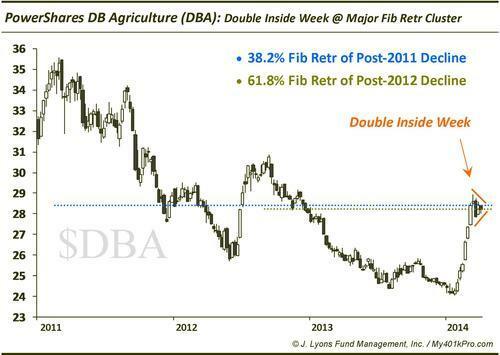 The PowerShares Agriculture Fund ($DBA) is forming a double inside week (and possible bull pennant) right at a major Fibonacci Retracement resistance cluster from the 2011 & 2012 tops. The breakout from this pattern could be explosive. As always (particularly these days), a false breakout that is reversed could result in an especially explosive move in the other direction.